The process and key considerations in the singulation of bare die, a crucial process step in getting a finished IC or Discrete bare die from wafer into the final assembly be it package, hybrid or direct-to-board. Mechanical quality - Assessed by visual inspection either automated or manual. The baseline quality for a bare die is that it passes electrical test at wafer level and passes visual inspection after the singulation and handling process into the shipping media. 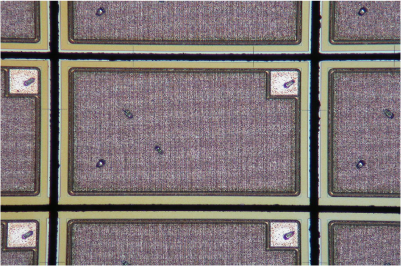 Pass wafer level test + Pass visual post processing = Bare Die considered good (relative to the electrical test performed). The sawing process is critical in that it is a majority contributor to mechanical quality and by default has an impact on yield, the number of good die per wafer. The most prevalent methods in use today are mechanical dicing and scribe & break. This is largely due to cost effectiveness in terms of throughput, cost of ownership and setup flexibility. An extreme highest quality outcome is required where price is no object. At Die Devices we are in the process of offering a mechanical dicing service which is suitable for a broad range of semiconductor materials. Where specialist dicing methods are needed we combine working partnerships with equipment makers and our own process knowledge to manage your project. Any history or experience with this material. Where street sizes are small or wafer thickness is high it can be beneficial to thin the wafer before dicing. There are two types of dicing method available, single pass or step cut, each cut has pros and cons. We recommend the process most suitable for the situation. Requires customer to accept sidewall step. 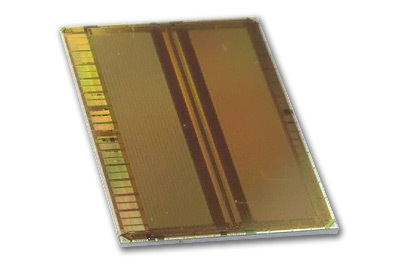 Wafers are mounted onto tape which is held on a Film-Frame. There are multiple tape options and the choice is dependent on the product type and further processing required either at Die Devices or at the customer's facility. For example, ultra-thin die are highly recommended to be sawn on UV tape. The standard frame we use is the Disco FFP-200 frame, other output frames such as Ring-Frame are possible subject to setup tooling and volume levels. After first article dicing each saw process is typically optimised over time with volume to produce the best quality for a given setup.